When I first read the synopsis on Amazon for Inside the Jihad, I almost didn’t buy it (which I bought used for like $2.00, btw!) – but I sure am glad I did. What was my cause for concern? Having been in Afghanistan, my initial hope was that this was a story that occurred post 9/11, or September 11th, 2001; however, when I realized that this true story took place – at least the majority of it – prior to 9/11, I started to hesitate on whether or not it would be worth it. The end result: it is arguably the best $2.00 I have ever spent, because I don’t care what Robert Ludlum novel you throw at me (they are all exceptional) – Omar Nasiri’s book will trump it. You know why? Because it’s non-fiction, as in true. Although the author – Omar Nasiri is of course not his real name – begins his story with his youth growing up in Morocco, and ends it with infiltrating terrorist affiliate cells in Europe, it was his gripping experience when he trained in the highly secretive, Al Qaeda training camps deep in the mountains of Afghanistan that really took this book to an elite level of suspense. As I mentioned earlier, it was common knowledge after 9/11 turned our country upside down that Al Qaeda, and the Jihadist forces in Afghanistan were training and fighting at high altitudes, and in extremely austere conditions. Even with that in mind, this portion of the book was absolutely incredible to read: just as a Marine squad leader or infantry platoon would hike 10-20 miles with 100 pounds of gear in preparation for a combat deployment to Afghanistan, the insurgents at these training camps – which included our insanely brave spy Omar – were not only doing the same thing, but they were doing it – and this is no joke – at much higher elevations, with much less oxygen, and with often times bare feet. I thought I had some bad foot blisters after some long humps with my sniper platoon, but running up and down mountains at night with bare feet over nothing but jagged rocks, just so “they can learn how to move completely silent” is just insane. 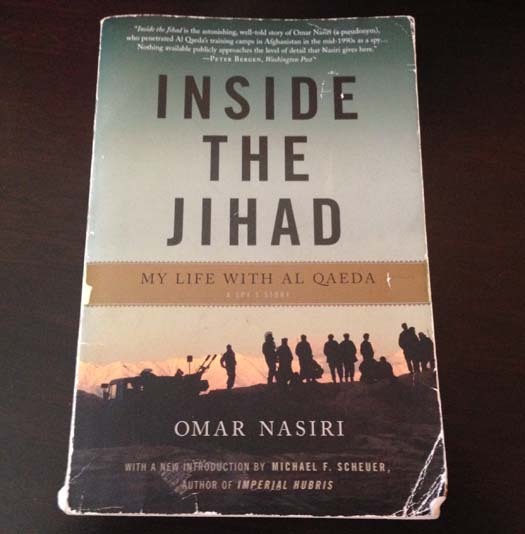 Inside the Jihad is an absolute must read, and not just for anyone who enjoys a good spy thriller or suspense story – the spy currently known as Omar Nasiri provides a legitimate inside look into how Al Qaeda trained, and that is something that every American should read. It will be the best $2.00 you’ve ever spent – I guarantee it. More book reviews coming soon – don’t forget to hit up our Read category for plenty more that are already live on SQ! I read this article on SQ and found it very interesting, thought it might be something for you. The article is called Books We Like: Inside the Jihad, My Life With Al Qaedaand is located athttps://www.slightlyqualified.com/books-we-like-inside-the-jihad-my-life-with-al-qaeda.